A marshy expanse of wetlands where plovers, sandpipers, dowitchers, and yellowlegs scurried across the damp sands at low tide, feeding, while bitterns stood like frozen sentinels, awaiting their prey, and mallard ducks and wild swans glided in the shallows, and eagles and osprey soared overhead, and the skies were darkened in season by migrating flocks of wigeons, oldsquaws, and mergansers. Estuaries teeming with mussels and clams and periwinkles, and oysters in great numbers, some large, some small and sweet, all of them inducing visions of tasty meals. And beyond the shoreline, low hills and towering forests of oak and chestnut and maple with strawberries in the spring, blackberries and raspberries in summer, and in the autumn apples and walnuts and wild grapes. Moving furtively in the brush were deer and wild turkeys, as well as raccoons and otter and quail and, lurking in dark wooded fastnesses, mountain lions and black bears and wolves. The air was clean, the land was lush and green. A glossy ad luring visitors to some distant, unspoiled Eden, a travel agent’s spiel replete with cooked-up, frothy vistas no place on earth could match? No, simply a realistic description of Manhattan in the early 1600s, when the first European settlers arrived. And today? I’ll spare you the obvious litany of cluttered urban woes, the cliché depiction of a cacophonous wilderness of asphalt, concrete, steel, and cement. But if you look about and look close, you’ll find that, miraculously persisting, there is still a wild New York. And I don’t mean teen-age gangs, madcap cyclists, screeching ambulances, or the naked cowboy or bare-breasted cuties exposing themselves to tourists in hopes of tips in Times Square. I don’t mean homo sapiens sapiens in any form, but real, wild, living creatures. Let’s start with a celebrity predator known to thousands. I mean, of course, Pale Male, a red-tailed hawk whose neck is unusually light in color, giving him his name. He first appeared in the Park in 1991, and since then has nested each spring with his mate of the moment in ornamental stonework high atop a residential building at Fifth Avenue at 74th Street, just across from Central Park. Pale Male’s marital adventures have always been observed from far below by a throng of eager fans watching anxiously with binoculars and telescopes to see if the young will hatch and survive, as many have done, leaving the nest to reside in Central Park. Pale Male’s consorts have a way of disappearing, often as a result of eating a poisoned pigeon or rat, but Pale Male survives, always taking a new mate that his fans immediately christen: First Love was followed by Chocolate, who was followed by Blue, then Lola, then Lima, then Paula, then Zena, then Octavia, and so it goes. If I say Pale Male is known to thousands, I’m not exaggerating, for he has been the subject of a one-hour documentary film and a book. An aging stud, he is the first hawk known to have nested in the city, and his fans are fiercely loyal. In December 2004, when the board of the co-op where he nested removed the hawks’ nest and the anti-pigeon spikes anchoring it, their action provoked an international outcry. The Audubon Society and the Central Park birdwatching community protested; TV celebrity Mary Tyler Moore, a resident of the building, joined the protest; the media reported the outrage; and passing automobiles, taxis, and even police cars sounded their horns in solidarity. A compromise was reached, a new cradle for the nest was installed, and the hawks began bringing twigs to the nesting site. The red-tailed hawk, the common resident broad-winged hawk of this area, is a thick-set bird with a wide, rounded tail; it is often seen soaring in circles high above the city. Seen from below, the tail is dark gray, but if seen from above, it is red, giving the hawk its name. I have seen Pale Male only in film, perched with his mate on his nest, where the scrawny young squirmed and bustled, but I have spotted other red-tails perched in trees in Pelham Bay Park. Red-tails have been known to nest on other tall buildings in the city, though none can match Pale Male for persistence and longevity. That the species nests at all in New York is an amazing feat of adaptation, given the numerous threats to it posed by the urban environment: poisoned prey, aggressively hostile crows, and when the hawks swoop low, risk of collision with passing vehicles. Pale Male is the only creature in this area I know of that has attained celebrity status; other denizens of New York habitats creep, skulk, or soar in anonymity. All the big parks harbor a surprising number of species, and Central Park is second to none. Prowling there by day in the spring, I have seen migrating birds by the score and even occasionally by the hundred in a single day, as well as hordes of termites hatching from decaying logs – a sight welcome to birdwatchers, since it brings hungry warblers down to eye level, as they feast on their teeming prey. more of a mournful whinny or wail. But Central Park by night is another story. Years ago, crossing it at night at 72nd Street to attend a poetry workshop on the Upper East Side, I treaded with trepidation, for the city then was rife with crime, streetlamps along my way were few, and my footsteps clicked on the pavement, announcing my presence to any nearby malefactors; the one bit of reassurance was a squad car parked halfway cross the park, Today, however, crime has declined, and venturing into the park at night has become the preferred pastime of a number of hardy and inquisitive souls. A Russian lady in an electric cart comes there nightly to feed peanuts to a bunch of rambunctious raccoons (against park regulations, I’m sure). Owl watchers have a only a precious half hour to spot screech owls, somnolent by day but on the hunt by night, before the gathering darkness renders them invisible. And “mothers” (rhyming “authors”) gather at the Shakespeare Garden to attract moths with a special battery-powered light, so they can marvel at the weird and spectral beauty of these rarely seen nocturnal creatures. (Once, on a tree trunk at High Rock Park on Staten Island, I was privileged to see a sleeping luna moth by day and marveled at its lime-green wings with eyespots and, yes, its weird and spectral beauty.) For all these visitors Central Park by night has a magic all its own, and they revel in its sounds: hoots and rasps of owls, yips of raccoons, and in dead leaves the rustle of white-footed mice. When not being fed by the Russian lady, Central Park raccoons – there are some 50 of them -- invade the trash cans by night to feed voraciously. Black-masked with striped, bushy tails, they are tough customers that other animals prefer not to mess with. I have seen them sleeping tranquilly by day in trees, but raccoons from Central Park have invaded West Harlem, prowling there by day, crawling over fences from one backyard to another, and even invading homes to the point where terrorized residents have pleaded with the city for help. A raccoon, having a meal. These guys also raided a henhouse in Brooklyn and killed all the hens, and even tried to do in the rooster as well. And in September 2014 a raccoon broke into a Bronx beauty shop and ran rings around the cops trying to capture it, leading them a merry chase that onlookers outside watched with amusement, until the officers finally managed to lock the intruder in a cage. These furry creatures thrive now in suburban and urban sites because they are amazingly adaptable and, like people, will eat almost anything. They are not to be messed with casually since, if cornered, they fight viciously, have sharp teeth that bite, and can carry rabies. Exterminators in the area, usually busy eliminating roaches, mice, and bedbugs, now advertise raccoon removal services as well. Yes, right here in New York – aggressive raccoons! Less pushy and obstreperous is another Central Park resident, the Virginia opossum, a cat-sized marsupial with a pointy white face that emerges at night to feed on slugs, grasshoppers, caterpillars, snakes, mice, bird eggs, acorns, berries, grass, and dead animals – just about anything smaller and slower than itself. When threatened, this sly character “plays possum” by rolling over in a deathlike trance, eyes closed, tongue protruding, until the threat is gone, at which point the opossum revives miraculously and resumes its slow nocturnal hunt for food. Also seen in Central Park at night are at least five species of bats, one of which, the little brown bat, I once saw zoom low over the Loch, a winding watercourse in the North End of the Park. I might have thought it a bird, but there was something weird about its lightning-fast flight over water, and another birdwatcher identified it for me. Had I seen it clinging to a tree, I would have found it eerie, for this long-eared little creature has long, spiky fingers that support the wings, giving it a demonic appearance. Few would call it – or any bat – beautiful, but we should be thankful for their presence, since one bat can eat 500 mosquitoes in an hour. Other residents of the Park include the Eastern chipmunk, the gray squirrel, wasps, hornets, slugs, snails, frogs, clams, and – appropriately in the Turtle Pond – three species of turtles. But that is hardly the whole story. An intensive 24-hour “BioBlitz” by scientists and volunteers in the summer of 2008 recorded 836 species in the Park, including 393 species of plants, 102 invertebrates, 78 moths, 46 birds, 10 spiders, 9 dragonflies, 7 mammals, 3 turtles, 2 frogs. Regarding the birds, 46 species is minimal; during spring and fall migrations they would have found hundreds more. But some species found in the Park until recently have disappeared: the woodchuck and the Eastern cottontail, both of which I have seen elsewhere. Not reported in Central Park but seen in Van Cortlandt Park in the Bronx, and in Alley Pond Park in Queens, is the red fox. I have heard of sightings in Van Cortlandt over the years, but on my many hikes there I have never seen one, and for good reason: they are nocturnal and, unlike the raccoon, very shy. They too eat just about anything – mice, shrews, moles, squirrels, rabbits, opossums, even those obstreperous raccoons, as well as turtles, lizards, snakes, and insects, and for a vegetarian option, acorns, cherries, berries, grapes, and nuts. When, rarely, they are sighted, it’s usually a quick flash of red and they are gone. A red fox, photographed in the photographer's back yard. Also not seen as yet in Central Park but appearing elsewhere is another newcomer, the coyote. Yes, we tend to associate the coyote with cowboys, Big Sky, and the shootout at the O.K. Corral, but the Eastern coyote, as its name implies, resides here in the East and has been extending its range southward to include the New York metropolitan area. Sneaking in from Westchester County just north of the city, it has now made its home for several years in parks in the Bronx and Queens, where residents rarely see it, but hear its howls at night and find their trash cans raided. And if they do see it, they often mistake it for a dog. Looks like a wolf, but it isn't. Looks like a dog, but it isn't. When coyotes first arrived in New York State is hotly debated. Some think they were here before European settlers arrived, and scattered to wilderness areas as woodlands were cleared for farms, then returned when farms reverted to forest. But others think they are new to the state, moving in from central North America only after settlers eliminated the wolf. They were first observed in northern New York in the 1930s, and by the 1980s had spread throughout the state. In 1994 one appeared in Woodlawn Cemetery in the Bronx – its modern New York City debut – and another was spotted a year later in Van Cortlandt Park. That coyotes should appear in the northern outer boroughs was not altogether surprising, since those areas had large parks, and freestanding houses with yards and alleys with trash cans that could easily be raided. But Manhattan, with its congestion, its busy streets, its noise, and its close-packed buildings, seemed an unlikely habitat for these skulking nocturnal scavengers. Until, that is, one crossed into the borough in 1999, probably following a train line, and another was spotted in 2010 at the Manhattan entrance to the Lincoln Tunnel – events that provoked a great media brouhaha, with helicopters tracking the intruders and videos of their capture circulating on the Internet. And the invasion continues. Last January a coyote was captured by the police on a basketball court after midnight in Riverside Park on the Upper West Side, and two weeks later another was captured in the residential complex known as Stuyvesant Town on the East Side of Manhattan. · Store food and garbage in animal-proof containers. · Keep pets on a leash, since coyotes have been known to kill them . Coyotes are relative newcomers to the city; by way of contrast, the city has always been besieged by rats. 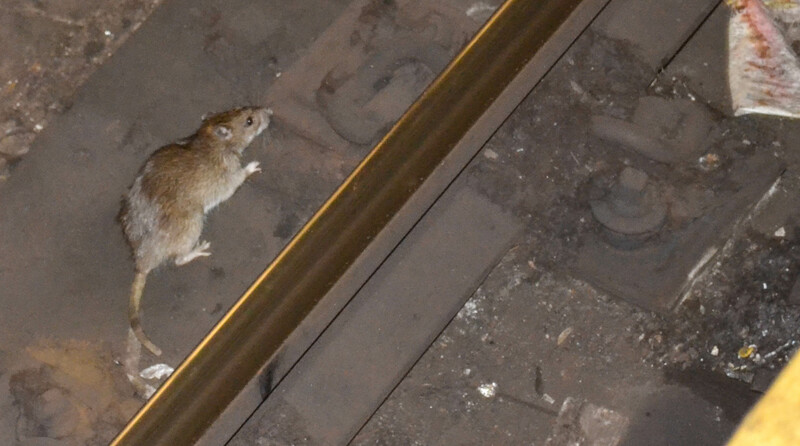 While waiting for a subway train, if you glance down at the rubbish-strewn tracks, sooner or later you are bound to see their fat brown bodies skulking about, eating what New Yorkers – some of us – cast so cavalierly down on the tracks. There are an estimated 2 million of them in the city (some would say more), averaging some 16 inches long and weighing 1 pound, though they have been known to measure up to 20 inches and weigh 2 pounds. Fat as they are, they can squeeze through tiny holes, leap 4 feet sideways, fall 5 stories without injury, and tread water for 3 days. Other accomplishments include the ability to chew through pipe, have a new litter every 2 months, carry pathogens that cause various illnesses, invade restaurants after hours, and crawl up sewer pipes to enter apartments through toilets. They have bitten infants and the homeless and have eaten corpses in the city morgue. Obviously, not the most desirable of neighbors. Is it any wonder that all 109 of the city’s mayors, almost without exception, have announced plans to eradicate this scourge, or that the scourge persists? Just where you'd expect him: in the subway. But the war continues. Our mayor, Bill de Blasio, has just included $2.9 million in the budget for rat control, rats being, in Hizzoner’s words, “one New York City institution that we’re happy to get rid of.” Inspectors are stalking neighborhoods on the lookout for signs of rat behavior, teams are being assigned locations, solar compactors and other rat-proof bins are being supplied to the Sanitation Department, and relevant city bureaucracies are being told to “think like a rat.” But the enemy is known to be diabolically clever, opportunistic, and not fussy when it comes to meals. Good luck, Mr. de Blasio. 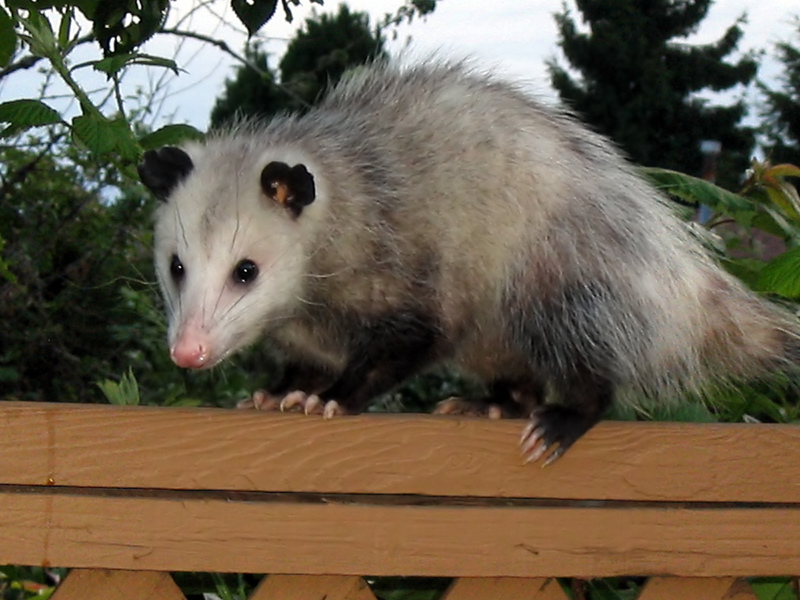 You’re up against yet another wild critter that has adjusted marvelously to urban ways and finds a feast in any trash pile, any garbage can whose lid is not securely fastened. They prosper because, alas, we feed them. Finally, having just scrutinized the ground and the sewers, let’s have a look at the skies, where two more large raptors can be seen soaring overhead. I have watched a pair of ospreys nesting in spring on a wooden platform built to accommodate them in Jamaica Bay Wildlife Refuge, sometimes both of them at the nest, with the scrawny young, beaks agape, just barely visible above the edge of the nest. And at times I have seen an osprey soaring, white below, its great outstretched wings marked with dark wrist patches, its black cheek patch sometimes visible. And once, hiking along the New Jersey side of the Hudson in November, I saw an osprey with a large fish in its beak, until, out of nowhere, a bald eagle appeared who grabbed the fish right out of the osprey’s break and made off with it – all this in a matter of seconds. Ospreys are big, but eagles are even bigger, and in nature the big guys always win. An osprey, extending its talons as it prepares to dive on its prey far below. The other large soaring raptor common to New York is the peregrine falcon, a crow-sized predator that, liking high cliffs, has adapted to the city, where it perches on ledges of skyscrapers and on bridges, and from there plummets at a speed of over 200 miles an hour – the fastest of any animal on earth – to seize a pigeon or mourning dove that it has spotted far below. Observed when perched, it shows color ranging from blue-black to slate gray above, and from white to rusty below with dark markings, its white neck marked with black cheek patches, or “sideburns.” And they do perch in the city, and not always at dizzying heights; my partner Bob’s doctor has shown us photographs he took of a peregrine sitting on top of a lamppost at Union Square. Male and female peregrine falcons. Long before seeing peregrines here in the city, I used to see them every autumn on Monhegan Island off midcoast Maine, where birders would come from great distances to watch them soaring or diving off the cliffs, perhaps feeding on the huge raft of eider ducks that always appeared there in the fall. One windy day when there were few birds to see, I went to Blackhead, a headland towering some 150 feet above the sea, where I lay down to get out of the wind, and saw, soaring far above me, three, then four, then five, six, seven peregrines, riding the air currents high in the sky. But there’s no need to go to Maine to see them, since there are more peregrines here in the city than in any other place in the world, though I can’t promise seven all at once. To see them diving at lightning speed, even though it means the death of some smaller bird, is to witness one of the wonders of nature, sudden, dire, and thrilling. This post deals with wild animals in the city, but plenty of wildflowers grow here too, as I have mentioned in other posts. If, at this time of year, I go out on errands or for a walk, within two or three blocks I can usually spot at least five wildflowers, often more. They grow in vacant lots, in small bits of greenery, out of sidewalk cracks, even off the sides of old piers, some of them too tiny to be visible from a standing position; to find them, I squat. Usually dismissed as weeds, they always excite me (no, not that way), for they are growth, exuberant life, Big Mama. Along with the insects, they will inherit the earth if we humans ever die out. On this happy note I’ll end. · Monsanto was once an underwriter of the program “Marketplace,” but WNYC is confident that Monsanto’s sponsorship of the show played no part in the news coverage. · Goldman Sachs is currently an underwriter of the program “Freakonomics,” but again, WNYC is confident that its coverage is not influenced by Goldman Sachs’s sponsorship. I will let the viewers decide whether or not the station can be blithely indifferent to where its money comes from. Monsanto and Goldman Sachs know how to play the game; they put their money where it counts. WNYC’s intentions are no doubt fine, but it might come down to which stories are not covered, or covered only lightly, rather than deliberate distortions of the news. The soundest policy would be to eschew (I love this word; it sounds like a sneeze) all donations from corporations whose activities are controversial. Coming soon: Religion in New York. How doughty old Peter Stuyvesant couldn’t stand Quakers because they quaked. Today, High Church, Low Church, and No Church. Who’s winning converts, who’s losing? Worshipers speaking in tongues and raising their arms in rapture, and the parishioners who won’t let their church close their parish. And yes, organized paganism and some atheist Satanists who want children to be allowed to pray in school … to Satan. So who said New York is godless? We’ve got gods and believers all over the place.